The Manor Class loco shown here is from a Malcolm Mitchell etched brass kit. These engines were introduced in 1938, and were quite versatile engines due to their relatively light axle loading. Image courtesy Malcolm Mitchell. 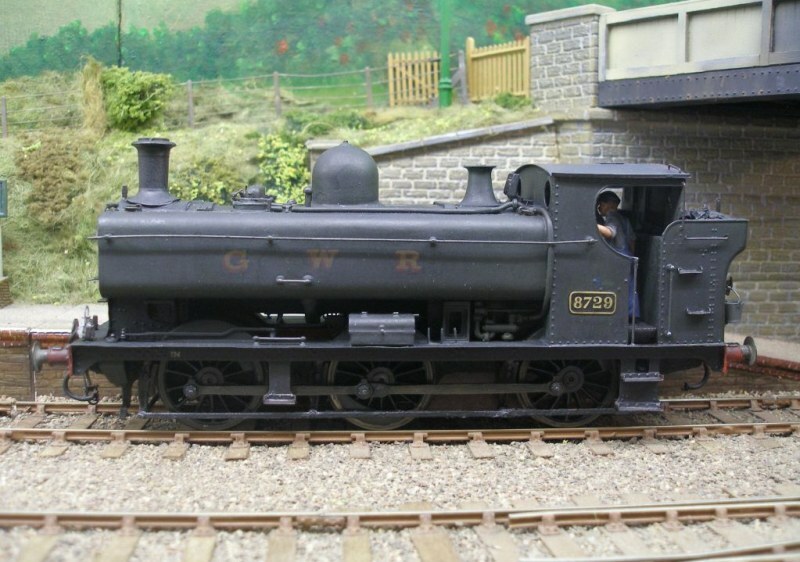 7mm Pannier by Paul Cambridge showing the scruffy appearance typical of many locos. The livery is green underneath the weathered grime. The loco is a Vulcan kit with added detail. Photo courtesy Paul Cambridge. From 1942, the shirtbutton ceased to be used. 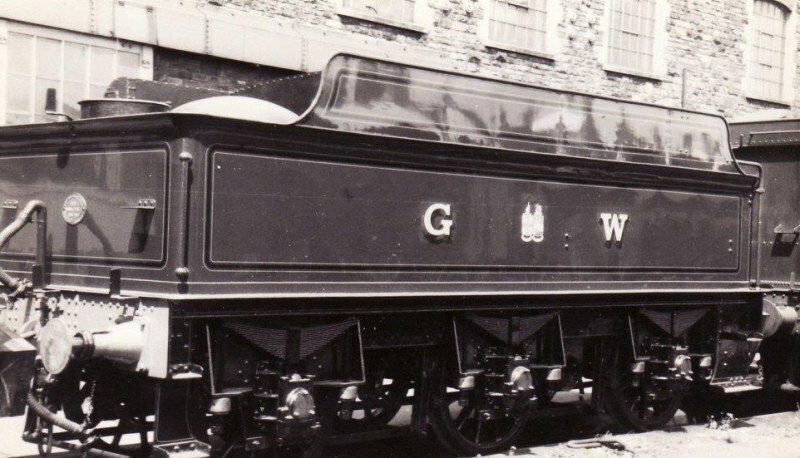 Ordinary passenger and goods classes carried the letters 'G W R' appropriately spaced on tender or tank sides, and express passenger locos had the Coat of Arms between 'G' and 'W'. On tank locos, there was some variation in the spacing between the letters 'G W R'. From 1942 to 1945, all classes receiving full repaints in the works, except for some Kings, Castles and Stars, were painted all black, as a result of wartime shortages. Locos were not lined, and it seems that safety valve covers were painted over. 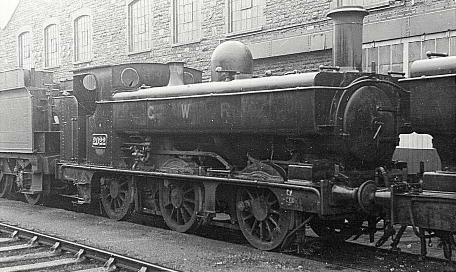 For locos painted black, the G W insignia did not have any black shading. 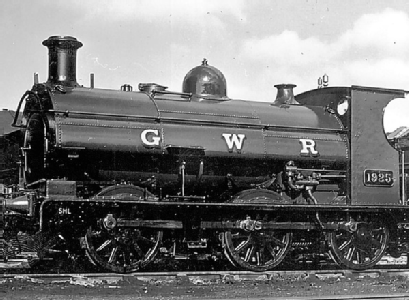 The insignia used for 'G W R' on some locos by Caerphilly Works during and after WWII was in a sans-serif font called Grotesque, but it isn't known whether it was in gold or straw colour. Here is a picture of a preseved 0-6-2T in the livery. Other examples are 1105, 5611, 5627, 6629 and 7200. 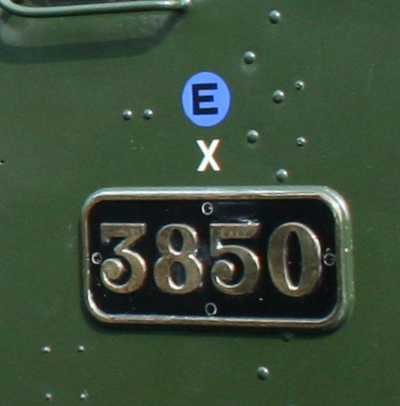 To aid their visibility in wartime conditions, power and route restriction indicators positioned high on cab sides were lowered to be above the numberplate. In WWII, Counties, Halls, Granges and some 2-8-0s were permitted to haul loads heavier than those specified for their power classification. These engines had a 2.5" white X painted above the number plate. This X notation continued into the BR(W) era. In 1945 green was restored, as was polished safety valve covers to those locos with copper-capped chimneys – as on the Manor shown above. Lining was restricted to the express passenger locos and their tenders, but loco valances, tender frames, cylinders, buffer housings, internal cab, and firebox lining over splashers were no longer lined. It is not clear how many classes were regarded as 'express passenger' in the immediate aftermath of WWII, and it is possible there was a degree of inconsistency in the application of lining to locos depending on the availability of painting staff. Some Castles appeared freshly painted without lining in 1946, and their tenders were also unlined. Halls were shopped without lining, but the new Modified Halls appeared with lining. Flush-riveted Churchward 3500g tender freshly repainted at Swindon in 1946. The tender appears to have been initially earmarked for ordinary use (with 'G W R'), but has had a quickie 'G coat of arms W' repatching for express passenger purposes. 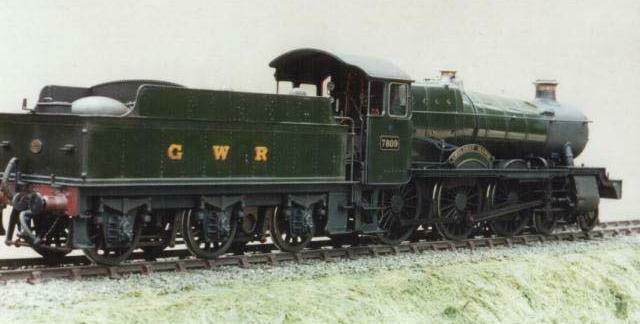 1925, in standard 1947 livery, and thought to be a unique repaint for a commercial feature film, was the only saddle tank to have been repainted in green post-WWII. A 1947 Swindon paint specification indicates that fittings on the tops of pannier and saddle tanks were in green. Tops and fittings on side tank locos remained black. In the same specification, green is cited for "cabsides front and back (inside and outside)" but black for "bunker coal space". Some tank locos took their G W R liveries up to their last days in the early '60s. See 9707 and 9703.